I was able to convince The Duc to accept an invitation to El Bulli. It takes years of being on the waiting list to get a table there. Later I read statistics: 300 000 requests and 8000 places per year. And The Duc did the math, half a percent chance per year of getting to taste the cuisine. We met our friends in the lobby of our Hotel overlooking the Bay of Roses and piled into the taxi that took us over the arid hill on a windy road to the location of El Bulli: a place, not even a village, but with a beautiful and intimate private beach (later I learned that some people come to the restaurant by boat). The air was perfect and there was a little breeze. We were led to a round table in the middle of the main restaurant room. And then the games began. We sipped dry sherry as the procession of little dishes-a mixture of amuse bouches-gradually turned into dinner…. The Duc took notes and gave a rating on the spot, and I took photos and have added my own notes in. Gin Fiz frozen caliente: As this Spanish name suggest it was both frozen and warm. They served it to us in martini glasses. I did not get a photo of it. It was green on the bottom half and a white creamy foam on top made with yogurt (Adria REALLY likes yogurt, as we found out during the course of the meal). It was surprising because the green (gin) part was very cold and the yogurt part was warm and creamy. The temperature differences were interesting. The Duc’s conclusion is that the guy has reinvented the gin fizz and rendered it less vulgar and therefore he is brilliant. Then came these little French fry like shapes in a little bowl Frutas LYO: (DUC rating: **) dried out fruit (‘lyophiliser’ a word I had never heard before in French but it means sort of freeze dried). It was pineapple. Without the juice. And a Styrofoam-like texture. The Duc thought it had a lime like aroma that gave it ‘jumpiness’ to the mouth. Pepitas de oro: (DUC rating: ***) chocolate covered walnuts. Perfect balance of 2 bitternesses. Very bitter walnuts and very bitter coco powder. The gold leaf on top of the little sphere gave the name to the dish. 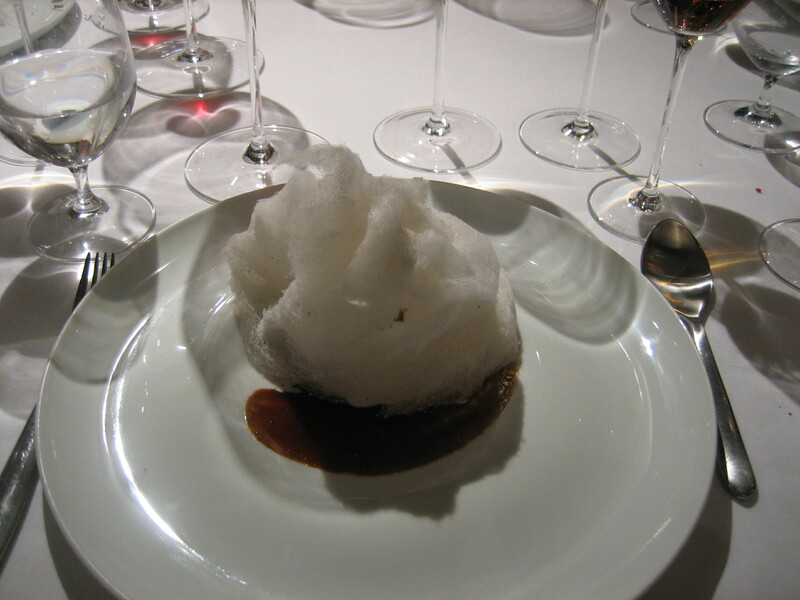 This is a good example of how Adrià played with our palates. These chocolate covered walnuts are very intense, bitter and rich. But since they are placed between 2 lighter, fruit driven (therefore sweeter and with more acidity) it works and our palates stay alert and awake. Teja de maiz y platano: (DUC rating: *) this was a corn wafer with banana dust. For The Duc the banana aroma was so strong that it seemed artificial. Texture was very surprising. The corn wafer was very thin and crumbly. Merengue/profiterols de remolacha y yogur: (DUC rating: ***) This was little puffs of beetroot and yogurt. This was perfect and red fruit aromas. Aromas that are noble and that the English often find in wines. Absolutely delicious and very light and airy both in texture and taste. In retrospect one of my favorite dishes. This taste combo has already inspired me at home. Beets are underrated! Catanias saladas: a chestnut covered with chocolate and a cream sauce. Good, but we missed details of this in our notes. Must have been distracted. It was another pairing of bitterneses. Chocolate salado de casis, yogur y pistacho: cassis and chocolate fabulous (DUC rating: **), pistachio was a little too salty relative to the chocolate. These were shaped like little miniature chocolate bars with six tiny squares. ‘Airbag’ de parmesano: (DUC rating: **) The Duc thought that the taste of Parmesan was too strong and dominant. These were very firmly crunchy. Looked like things that we get traditionally for aperitif like puffed squares that were very parmesany and with some sesame seeds on top. I liked them. Bonbons de mandarina , cacahuete y curri: (DUC rating: ***+ because of the complexity). Curry and peanut butter was so long and complex where as peanut butter is such an ordinary base product. This was very surprising because the peanut butter was really intense and bitter and fatty in the beginning of the mouth, almost overwhelming and then soon the curry kicks in and balances out the experience. The mandarin was separate, in a square like a candy if had fleur d’oranger in it and was fabulous and it was a palate cleaner after the peanuts. Divinely Light and airy. Pistacho con su miele e Roquefort: (DUC rating: no stars, he thought this was a failed dish because it was too sweet and that the Roquefort had not place there) This had a little gin in it too. I liked the combination of pistachio and Roquefort, because the inherent sweetness of pistachio went well with the bitterness of the Roquefort. But I was a little disturbed by the gin, which I felt dominated the dish. Bizcocho de sesamo y miso: It was like a black sesame airy sponge cake with a dollop of miso (?!). The Duc describes this as a dust ball and an utter failure. It did sort of look like a dust ball, but I liked it a lot. I think the flavor of black sesame is very complex because it balances certain sweetness with bitterness. The miso gave it energy and the texture made it something that you could sink your teeth into which is usually quite hard to do with black sesame because the seeds are so small! Papel de fiores: flattened cotton candy with flowers that looked like hand made paper. The flower petals and the cotton candy combination was great and delicately sweet but I bit into a very bitter flower head that dominated my mouth for too long. The Duc said it was a difficult dish to understand although the intensity of the aromas of the fruits and the flowers good. (DUC rating: ***) No nose to the dish. It is all mouth. Fondant de franbuesas y vinagre de frambuesa: a little too much wasabi on it, but when you taste what it does to the framboise, it was off the charts (DUC rating: *** for precision) Naturalness of the concentration of flavors like no other dish and so simple. This was one of my absolute favorite dishes of the night. For its wild audacity, simplicity and perfection. The blend of wasabi and the inherent acidity of raspberries with the fruit are exceptional. Yogur de ostras con px en tempura: This was an oyster and yogourt soup in a little glass and a marble shaped ball of Pedro Ximenes sherry. The yogurt accentuated the complexity of the milkyness of the oyster. Off the charts for the oyster soup (DUC rating: ***+) the Pedro ximenes was too sweet and since we thought that the 2 were supposed to be experienced together, we destroyed the length of the oyster soup by following it up to soon by the PX. Wine and food marriage a failure. Mejillones al limon e hinojo: ‘Mussles-en-crazy’ is how The Duc renamed this dish. 3 mixtures, a Mussle with orange: (DUC rating: **), b-Mussle with lemon (DUC rating: ***), Mussle with fennel (DUC rating: ***+) Overal dish was perfect. Delicious, surprising. Exceptionally simple. Judion con pancetta joselito: White bean with ham. (DUC rating: ****, no ham, no beans, it was all in juice and The Duc is a juice guy.) The peasanty dish became noble and digestible and precise and concentrated and without fat. And tasted better than the real thing. Aire helado de parmesano con muesli: frothy mousse-like Parmesan ‘air’ with dried raspberries apples and walnuts. (DUC rating: ****, the best air and the best parmesan) Parmesan did not overwhelm and the fact that the fruits were dried they went well with the parmesan and were able to stand up to it. Dashi con caviar de miso: gelatin of smoked tuna and miso caviar and ink of squid. The smokiness and the ink and the miso all mixed various bitternesses that made the caviar seem sweeter than ever. (DUC rating: ***) This is sort of a farce because he has no expensive ingredients like in other 3 star restaurants. Even if you think you are getting caviar! It’s miso caviar! And although the taste was not exactly like that of caviar, the taste texture combo was perfect. Anchoa con jamon y yuba de yogur: anchovies, ham, yogurt and fried breadcrumbs. All the bitterness made the anchovies seem sweet. Good idea for a spoon (DUC rating: ***) One of the most harmoniously delicious dishes of the evening. Surprising because of the yogurt but something to sink your teeth into! One of my favorites of the evening. Dacquoise de pina verde y pinones: pine nut ice cream cup with chopped pine nuts. On top of this was poured pine essence. The 3 different expressions of this nut, which is taken for granted, brought out its nobility and complex facets. (DUC rating: ***). This dish was funny because the ice-cream cup started to melt as we were eating it. Pine nuts and pine is a surprising texture and flavor combination. Cascara de pinones: pine nuts and bananas (DUC rating: ***) This is a dish that only The Duc had because he was allergic to the next dish, but he tried it anyway. Noquis de polenta con café y yuba al azafran: (DUC rating: failed dish because the dominant flavor is parmesan). Polenta gnocchi with coffee, parmesan and capers. I thought that the bitterness of the coffee went really well with the polenta. Ajo con coco: three different varieties of garlic with a coconut sauce. The white garlic was fabulous, the black one was sweet, and went less well with the coconut. And the red/black garlic was spicy it also went less well with the coconut than the white garlic. The coconut sauce was not sweet. But very creamy. Ventresca de caballa teriyaki: Japanese sesame sauce. Chopped olives, black cherry in a mouse and on top of the mackerel there was the kind of sauce that resembles what you get on eel sushi (sweet Japanese bbq-like sauce.) What makes it fabulous is the balance of the different sweetness and bitterness. (DUC rating: ***) This dish was beautiful with the black cherry froth that covered it. It was delicious, again with very simple, inexpensive ingredients. One of the big time favorites of the evening. 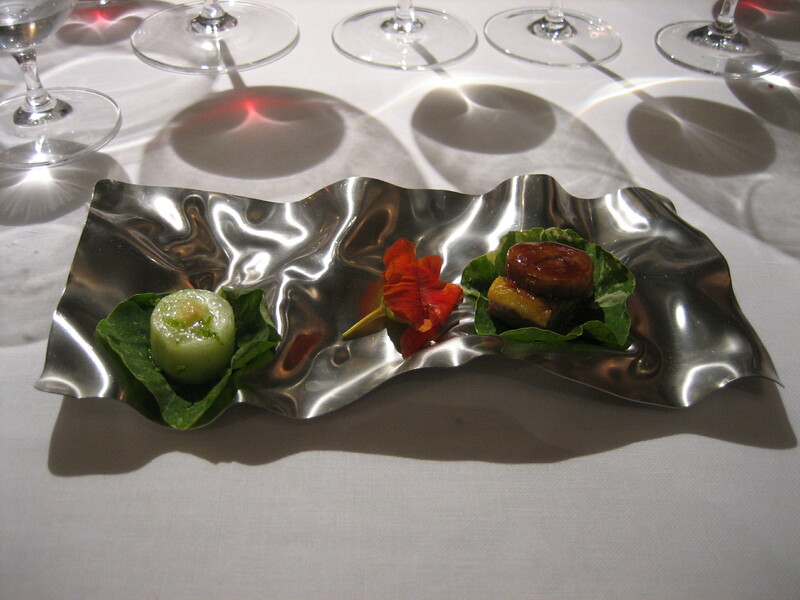 Anguila-tuétano de ternera con hojas de mostraza: Eel, bone marrow and cucumber (DUC rating: failed because too salty, but the cucumber alone was *** and a reinvention of cucumbers). Jugo de liebre: sauce of hare with an apple jelly and a ‘feuille d’huitre’. 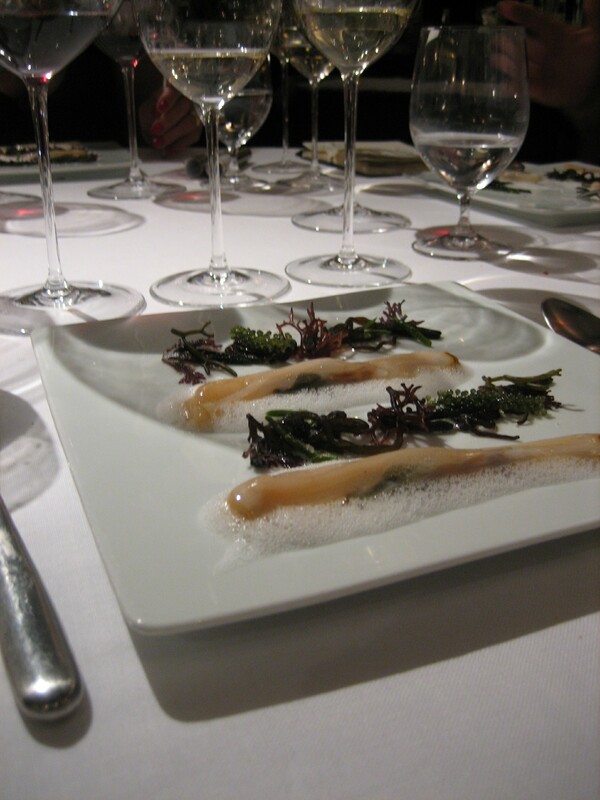 Truffle sauce and essence of wild hare without any animal fat or signs of meet. (DUC rating: ****, because the alaroso sherry matched the dish perfectly) This was one of my least favorite dishes. I didn’t think the ‘feuille d’huitre’ went with the dish at all. And the apple/hare combination was less exciting than some of the other dishes. La lana 2007: cotton candy with bananas and walnuts. Beautiful. Fairly good combo. 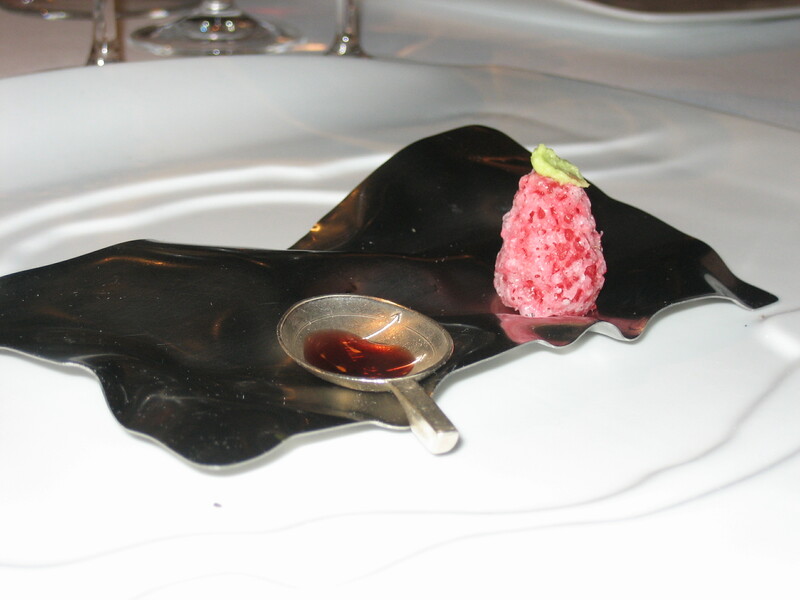 orquidea: a chocolate desert that was beautifully presented on the plate in the shape of an orchid. Not my favorite because I’m not a big chocolate person. As an apreritif, we had some Dry Fino sherry which went well with the bitter oriented concoctions of amuse bouches. Then, The Duc’s idea, to which our friends agreed, was that we should start off with 3 bottles of wine. Two white and one red. We asked the sommelier to serve them all at the same time. So that we could play (have several options with each dish and decide which dish needed which wine combo. The thinking behind this is that not knowing what to expect of the cuisine, it would like too much time to taste once, decide which wine would go well, get the sommelier to get it for us etc. Plus there were way too many courses to do that, which is what we usually do in restaurants). So with three different wines in front of us, all of different styles, we could pair and play as we liked. By the time we finished it was past midnight. And, although I was by no means hungry, I was not stuffed. Rather pleasantly stunned. Both taste bud wise and intellectually too. I could not have synthesized the meal then. I needed to digest it all…. Now, I know that it was more than the exact flavor combinations that hit me. 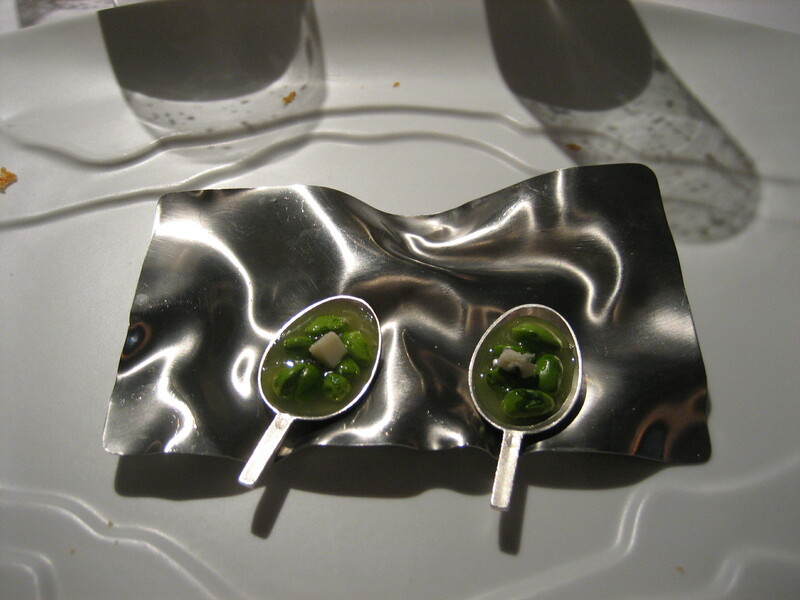 The spirit of El Bulli is an admirable one. There are no expensive, super rare ingredients. Nothing that the average person could have access to or afford. Probably the most expensive ingredient he used was Parmesan. To me this is brilliant. What is left with me is the memory of this wonderful playful spirit and experience. And it inspires me to keep the ‘play’ and the ‘accessible’ in my culinary adventures.